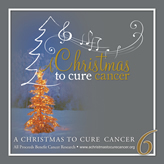 This is our tenth year of A Christmas To Cure Cancer, the sixth Christmas CD and fifteenth charity CD overall. Lorne has past his 10-year anniversary of being cancer free, which is the best news I can continue to share here. He's still playing Elvis music with Mike Albert and The Big 'E' Band, as well as performing in church and other special engagements. To celebrate our tenth anniversary, A Christmas To Cure Cancer 6 is a double CD set. We went back through the first five CDs. There were so many good songs it wasn't easy to select just 21. We hope you enjoy this special collection from the first ten years. As with every CD I've produced, Cody Romshak and Dave Clo play a major role in helping me not only complete the project, but also ensuring we have good recordings and music to share. I can't thank both of them enough for all their help. This CD is the product of 39 artists, with the majority hailing from Ohio. I also want to thank and welcome the new members of the Christmas To Cure Cancer recording family: Miss Ohio Ellen Bryan, the Hot Pink Racers, Angela An, Chuck Strickler, Omar Coleman, Marty Romie, Jared Craig, Danielle Elias, Kim Shama-Hanna, John Hummel, Amy Frazier, Nick Garner, Abby Dodds, Johnny DiLoretto and cancer survivor Maria Durant. In addition to A Christmas To Cure Cancer projects, we are partnered in Sean Carney's Blues For A Cure and the Buckeye Cruise for Cancer. Cancer research and treatments continue to increase the chances of survival when discovered early. It's this continued progress that motivates us to work as hard as we can to help speed the discovery of a cure. Words and Music by Moraine. Universal-MCA Music Publishing Div. of Universal Music Corp. Recorded at Tony’s Treasures Studio, Cadiz, OH. Words and Music by George Michael. Chappell & Co OBO WHAM Music Ltd.
Instruments recorded at Sonic Eden in Nashville, TN, John Albani engineer, vocals recorded at Sonic Lounge Studios in Grove City, OH. Joe Viers engineer. Mixed by Joe Viers. Produced by James “Bubba” Hudson. "HPR dedicates songs to: Heather Pick, Stefanie Spielman, Teresita Warneke, Kim McCanney, Lynn Knox, Pico Cavedo, Ervin Erlanger, Trevor Ambrose, Robert Delay, Connie Jingo, John Jingo, Mary (Jingo) Fleming, Tommy Parker, Vincent Marchese, MaryLynne Hayes-Murphy, Peter Marchese, Josephine Marchese, Richard Brigode and Vicki Speakman." Words and Music by John Wallowitch, Anna Mae Wallowitch publishing. Words and Music by David Foster and Linda Thompson Jenner. Warner-Tamberlane Publishing OBO Linda’s Boys Music. Peermusic III Ltd. Piano and Strings recorded by Tony Bonardi. Guitar Recorded at Camp David Studio, Nashville, TN. Recording Engineer Dave Clo. Recorded at Tony’s Treasures Studio, Cadiz, OH. Words and Music by David Plantz © 2011. Words and Music by Dave Clo © 2011. Dave Clo Music ASCAP/SESAC. Recorded at Camp David Studio, Nashville, TN. Engineered and Mixed by Dave Clo. Words and Music by Johnny Moore and Lou Baxter. Unichappell Music, Inc. Arrangement by Matt O’Ree © 2011. Words and Music Joey Ramone. WB Music Corp. Words and Music by M. Phillips and J. Josea. Universal Music Careers. Arrangement by Cody Romshak © 2011. Words and Music by Frank Loesser. Frank Music Corp. Publisher. Piano, Strings and Bass Synth recorded by Tony Bonardi. Vocals recorded at Steezo Sound in Gahanna, OH. Recording Engineer Eric Jones. Guitar recorded at Camp David Studio in Nashville, TN. Recording Engineer Dave Clo. Drums Recorded at Tony’s Treasures Studio, Cadiz, OH. Piano recorded at Angela An’s home by Mark Puskarich. Vocals recorded at Sonic Lounge Studios, Grove City, OH. Recording Engineer, Joe Viers. Music and Arrangement by Roger Hoard © 2011. Piano by Tony Bonardi. Vocals recorded at Tony’s Treasures Studio, Cadiz, OH. Words and Music by Ralph Blane and Hugh Martin, EMI Feist Catalog, Inc. Words and Music by Sammy Cahn and Jimmy Van Heusen. Kobalt Music Pub America I OBO Music Pub Company of America. Words and Music by Jim Brickman. Universal Music-Multisongs Brickman. Recorded at Angela An’s home by Mark Puskarich. Recorded at PrimeTime Studio, Akron, OH. Recording Engineer Tom Hanna. Words and Music by Alan Anthony Silvestri and Glen Ballard. Universal Music Corp. OBO Hazen Music. Sony/ATV Tunes OBO Jobanala Music. Piano and Strings recorded by Tony Bonardi. Guitar and Bass Recorded at Camp David Studio, Nashville, TN. Recording Engineer Dave Clo. Recorded at Tony’s Treasures Studio, Cadiz, OH. Mastered by Mark Puskarich, Columbus, OH. For additional pictures and videos, and the latest on fundraising and concert dates, please visit our website at www.achristmastocurecancer.org. A Christmas To Cure Cancer, Inc. is an IRS registered 501(c)(3) non –profit corporation EIN-83-0372707. CD graphic design by Carol Brown and Andrew Schall. CD insert graphic design by Andrew Schall and Matt Cooperrider. A Christmas To Cure Cancer logo designed by Laura Strickland. CD cover tree photo by Jeff Schultz/AlaskaStock.com © 2011. Our favorites from A Christmas To Cure Cancer 1 - 5, the first 10 years.